Breaking the barriers of standard torch design, Travis Industries proudly unveils the Tempest Torch – a dramatic outdoor gas lamp. The patent pending Tempest Torch creates a natural venturi without the use of electricity or a fan. This natural venturi effect causes the flame to spiral and dance within the tempered glass walls. Created as an outdoor furnishing for a wide-array of exterior settings and applications, the display possibilities are nearly endless: outdoor living spaces, retail or business storefronts, front walkway pillars, mounted onto movable bases or featured on an exterior wall by an entry. It’s built with durable heavy gauge steel; it’s built in America; and it’s built to last a lifetime. We invite you to succumb to the allure of this grand ﬁrepit… the powerful lines, the intriguing metal work, black paint ﬁnish, the custom four-post artwork, and the stunning ﬁre that you, your friends and your family will gather around for generations to come. FMI takes the Renaissance Series outdoors with the Tuscan. This wood burner features the industry’s only single piece, clean, brushed stainless face, stainless mesh screens with hidden screen pockets. 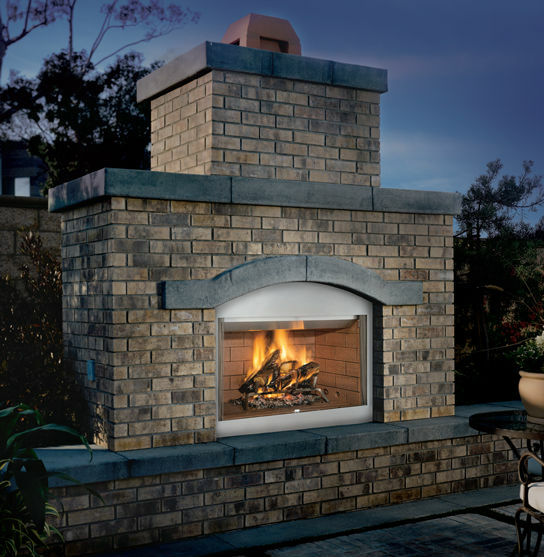 Other standard features include realistic textured brick liners available in Natural White and Warm Red, full length nailing flange drywall stops, EZ access damper and gas log ready feature. All models are approved for indoor as well as outdoor use. SunSetter has totally rethought flagpole design, to create the ultimate telescoping flagpole for home and business use. This remarkable pole eliminates the tangling, noise, maintenance, and hassle of conventional flagpoles, allowing you to attach and fly up to two flags easily and beautifully. It’s easy to use, easy to install, it’s even portable, for use at sporting events, races, and tailgate parties. Easy to mount on a dock or deck as well. Locking collars and base. It’s portable! Take it with you to sporting events and tailgate parties.